Looking for perfect gift for your children or grandchildren? Instead of giving cash or the latest gadget, try giving a financial gift. 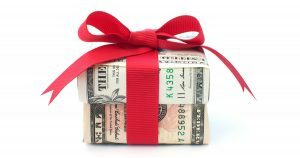 These gifts will help your loved ones to develop valuable money skills that will last long after the holiday season. Giving shares in a mutual fund can be an excellent way to educate your loved ones about investing. Some funds offer a great opportunity for young investors to learn about the market by providing materials that help youngsters learn about the stock market. Age-appropriate newsletters and reports explain business and investment concepts. You can use any of the popular “direct stock purchase” sites to buy individual shares of stock for your family. Consider purchasing stock in a favorite clothing, toy, or computer company that will be familiar to budding investors. Many Internet sites have lower minimum investments than buying stock directly from the company, and much lower commissions than even discount brokers. A good get more information is E*Trade.com. Don’t forget US savings bonds, either the old-fashioned Series EE bonds or Series I bonds, whose interest rates change every six months to keep up with inflation. You can purchase them online at treasurydirect.gov or at your local financial institution. Remember: the interest is up to 100% tax free when used for college, if your income is less than $ 106,650, but to get the tax advantages of these bonds for college financing, you must buy them in your name, not the child’s. A Section 529 college savings plan can be a perfect holiday present. Money invested in these accounts can be withdrawn tax-free to pay for college expenses. Many plans will let you start an account for as little as $50. Unlike custodial accounts, these plans do not affect qualifications for financial aid-and the giver always retains control over the investments in the plan. Money in these plans can be used for college in any state, and can be transferred among children in the same family. Also, in some states, contributions to these plans are tax-deductible, with tax-free withdrawals as well. You just can’t beat that! For information about the 529 plan for your state, click here. You can also give the gift of financial education. Possible gifts include a subscription to a financial magazine, a book on personal finance (see the WIFE Bookstore for a recommended reading list), a local community college course on money management, or a session with an experienced financial planner.